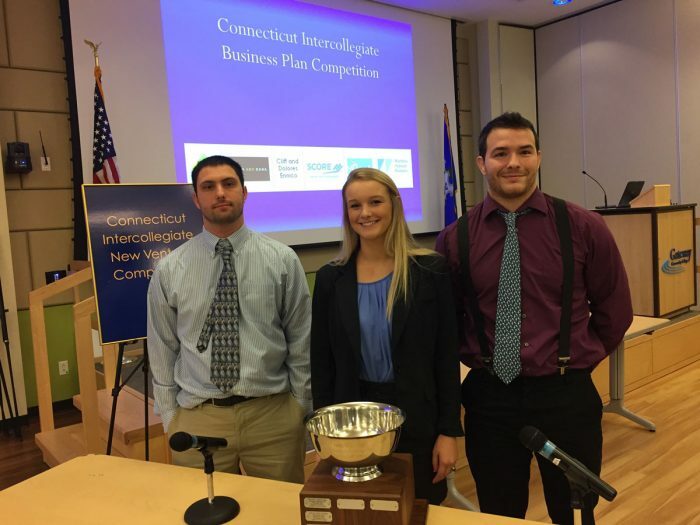 It’s a three-peat for Southern’s business students in the Connecticut Venture Capital Investment Competition (VCIC). The team of Paige Decker, Tyler Fedak and Mike Sullivan earned first-place honors recently to mark the third consecutive year in which an SCSU trio triumphed in the event. Student teams from Connecticut colleges and universities presented business and investment plans for hypothetical companies, which were evaluated by investment industry professionals. The program was held at Gateway Community College. Connecticut is the only state with its own VCIC competition, according to Mike Roer, president of the Entrepreneurship Foundation Inc., which sponsors the statewide event. On the basis of its victory, the SCSU team advances to the New England Regional Finals in Boston on Feb. 24. Southern will compete against schools such as Boston University, Wharton School of Business (University of Pennsylvania), Yale University, Cornell University, and Babson College. In addition to retaining the Connecticut team trophy, the team also earned $1,000 for travel expenses to the Northeast Regional competition. Benjamin Abugri, chairman of the SCSU Economics and Finance Department, said he was proud of the students. Roer explained that under the rules of the VCIC program, the first team to win three competitions gets to keep the team trophy. A new one will be purchased for future competitions. If she had to do it all over again, she’d wouldn’t change a thing. Lushka Vazquez is graduating with her second degree from Southern this May. As a graduate student in Southern’s exercise science program with a focus in human performance, Lushka is determined and driven by nature and by trade. She loves to challenge herself and has high professional aspirations. When asked why she chose Southern, Lushka pointed to the location of the university, the cost of attendance, and our well-known exercise science program as key factors. She also appreciates the opportunity to continue growing in her field as a graduate student. “Based on the professor’s experience and knowledge, I love it here,” says Lushka. She explains that each professor in the Department of Exercise Science holds a doctorate, and they each bring their diverse backgrounds and expertise to the classroom. “I enjoy Southern’s atmosphere and having the same professors for the graduate program also helped my transition [from undergraduate to graduate] go smoothly,” she explains. In addition, she believes that the opportunity to pursue a graduate internship at Southern stood out from other universities. 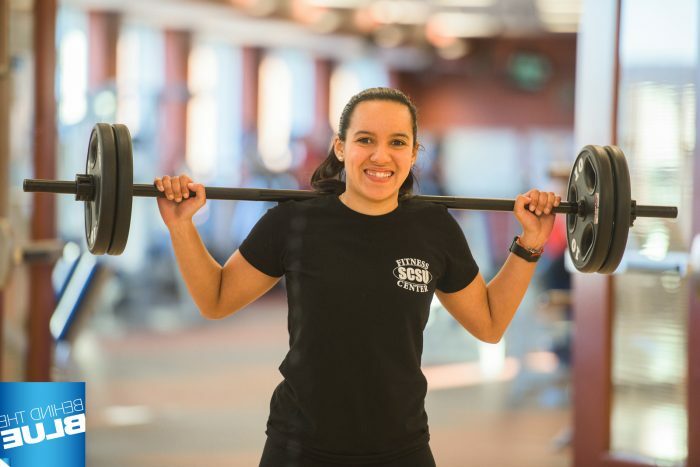 Lushka works 35 hours per week as the graduate intern in the SCSU Fitness Center. She is also a personal trainer and helps coordinate events within the facility, which gives her the opportunity to build her resume while earning her degree. And now Lushka is thinking about pursuing her own doctorate in Physical Therapy. If you want to know how she does it or learn more first-hand about Southern’s graduate program in Exercise Science, you know where to find her! Southern will provide residential leadership scholarships that cover housing expenses for 10 incoming New Haven Promise scholars beginning next fall. 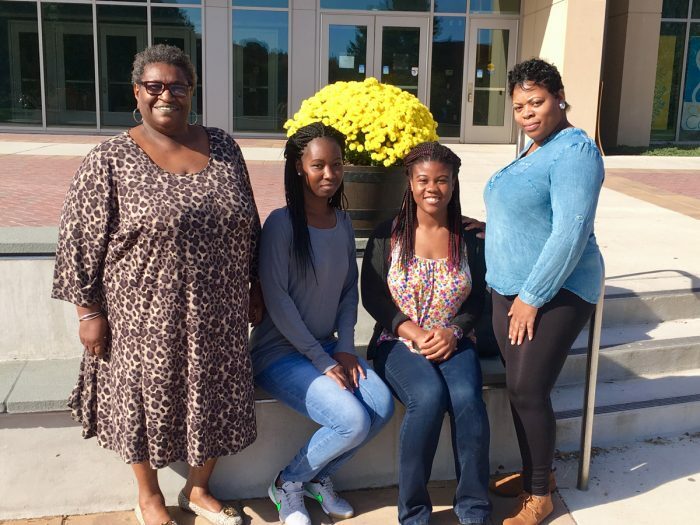 The selected students — known as Promise Community Ambassadors — will provide mentorship and outreach to Southern’s New Haven Promise scholars and high school students in the New Haven Public Schools. To date, SCSU has had more New Haven Promise scholars (339) than any other university. To be eligi­ble, students will be able to indicate interest and submit an essay on the New Haven Promise senior application. In addition, they will be instructed to supply a letter of recommendation. 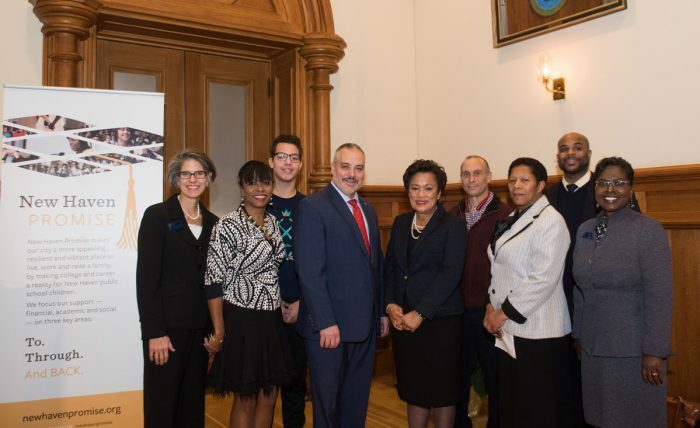 University officials — in collaboration with New Haven Promise — will select the recipi­ents of the residential leadership scholarships. New Haven Promise Community Ambassadors will participate in the Freshman Leadership Experience (FLEX) pro­gram, a six-week leadership experience beginning in August of their first semester, which will prepare them to serve in their campus and community roles. Ambassadors will explore their leader­ship potential, participate in meaningful leadership experiences, interact with current student lead­ers, faculty and staff, and discuss topics impacting students. The program commitment will last the entire academic year. The New Haven Register, New Haven Independent and Channel 8 each ran stories about the press conference and the new scholarship program. For more than a decade, Philosophy Professor David Pettigrew has been traveling to Bosnia to perform research, give lectures and interviews, and advocate for the victims of atrocities in Bosnia and Herzegovina. Bosnia and Herzegovina declared independence from Yugoslavia on March 1, 1992, triggering a secessionist bid by the country’s Serbs backed by the Yugoslavian capital, Belgrade, and a war that left about 100,000 dead, including the mass slaughter of many Bosnian Muslims by Serb forces. In addition, the crimes committed at the town of Srebrenica have been ruled to be genocide. While all his efforts are part of a personal commitment to human rights and social justice, Pettigrew’s work on Bosnia also has an academic dimension, expressed through his lectures, publications, film screenings, and other work. He also teaches a holocaust and genocide studies course at Southern. In late November, Pettigrew traveled to Bosnia to give two lectures in Sarajevo and an interview with the Federal News Agency (FENA) regarding the then-impending verdict in the Ratko Mladić case. The case concerned crimes Mladić committed during the Bosnian War in his role as a general in the Yugoslav People’s Army and the chief of staff of the Army of Republika Srpska. The verdict was delivered on November 22: Mladić was convicted of 10 of the 11 charges against him, including genocide, and sentenced to life imprisonment. 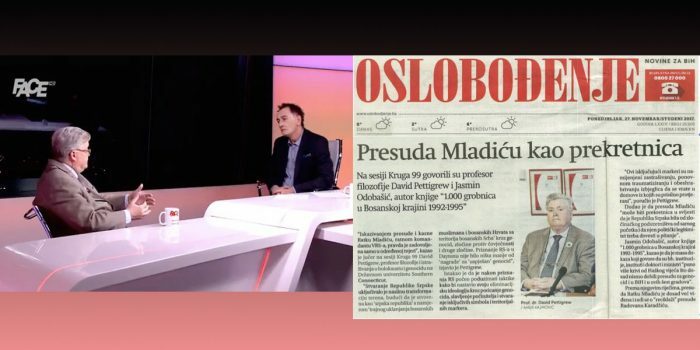 Following the verdict, Pettigrew was called upon for expert analysis, appearing on one of the most popular talk shows in the Balkans, seen by Bosnians around the world, and now with over 20,000 views on YouTube. Earlier this year, in July, Pettigrew was in Bosnia for about three weeks, during which time he gave lectures and interviews and engaged in activities around genocide recognition. 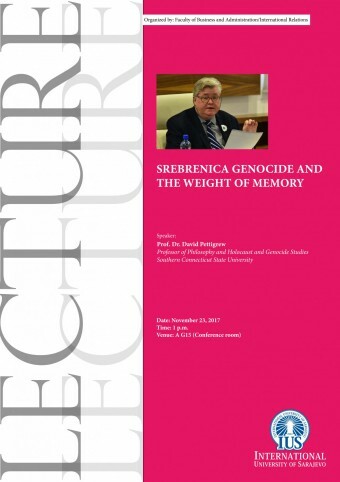 He gave three lectures: one for KRUG 99, an association of independent intellectuals in Sarajevo; one for the International University of Sarajevo Summer Program; and one for the American University in Bosnia Summer Program. His lectures largely addressed obstacles to justice and reconciliation in Bosnia and Herzegovina. He also gave three interviews, two for television and one for an academic journal, Novi Muallim. During the July trip, Pettigrew also met with representatives from the International Commission on Missing Persons, the United Nations Development Program, and the European Delegation in Sarajevo. He attended a book launch by a genocide survivor and met with a foreign affairs adviser to the Bosnian president. In Višegrad, he went to see the new 15-foot-tall Russian cross that had been erected in honor of the Russian volunteers who served (that is, “committed atrocities,” says Pettigrew) with the Bosnian Serbs. Pettigrew calls the cross “another example of the glorification of the perpetrators.” He traveled to Srebrenica in order to help receive 71 coffins of genocide victims who had been identified for burial this year. He was an invited guest at a commemoration ceremony on July 11 with genocide survivors and dignitaries from around the world. 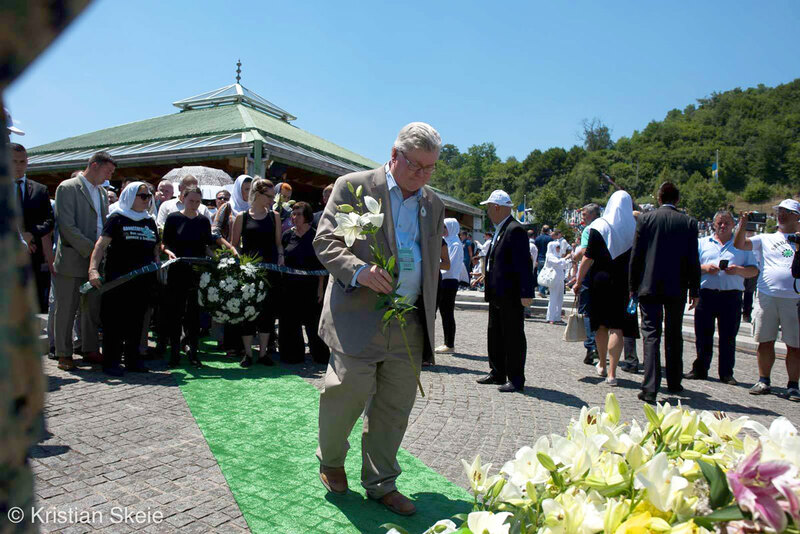 At the memorial service Pettigrew attended in the Srebrenica-Potočari Memorial Cemetery in July, people were burying their loved ones whose remains had been exhumed from mass graves and identified for burial. At one point, after Pettigrew had helped one family bury a loved one’s remains, a man stopped him and said “I know who you are and what you are doing, and I want to thank you for everything you are doing for my country [Bosnia]. I only ask that you promise that you will never give up.” Pettigrew promised the man he would not. 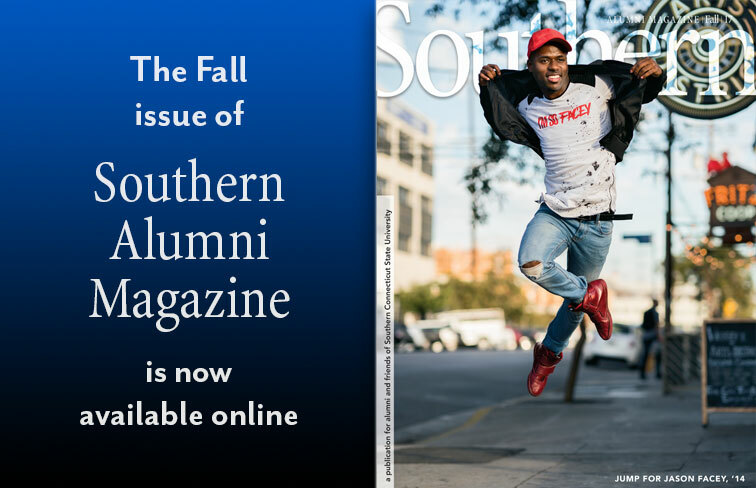 Since 2007, university photographer Isabel Chenoweth has told Southern’s story through photographs. Here are a few of her favorites. 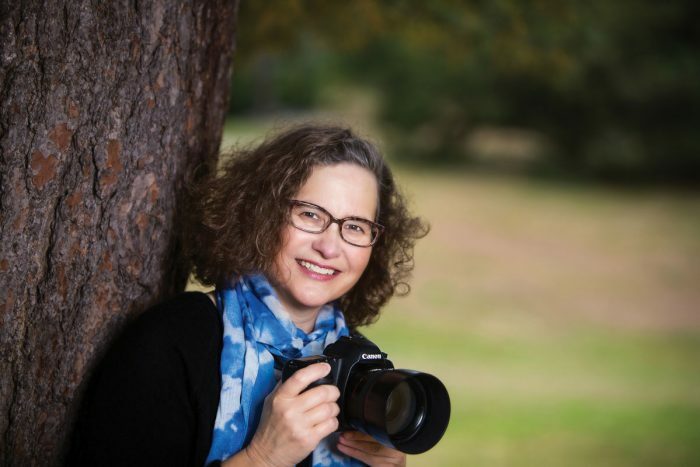 University photographer Isabel Chenoweth has photographed campus for a decade. Isabel Chenoweth has searched for light in the darkest places — including the basement of James Moore Field House. In Hutchinson Natatorium. Under the water. On that particular day — April 8, 2013 — Chenoweth stood in the humid-thick air, her mind set on finding a new way to photograph Southern swimming sensation Amanda Thomas. Thomas, among the most celebrated student-athletes in Owl history, would go on to graduate with two degrees in exercise science (a bachelor’s in 2013 and a master’s in 2015) and four first-place finishes at the NCAA Div. II national championships. But at that moment some four and one-half years ago, victory would be a simpler thing for the 18-time All American — look serene while swimming horizontally across the pool, face aimed directly at a viewing window where Chenoweth stood camera-in-hand. The resulting shot is one of Chenoweth’s favorites — and that is saying something. As of July 2017, she has chronicled campus life for more than a decade, taking close to 50,000 Southern-related photographs every year. The subjects and assignments are decidedly varied. They include portraiture, event coverage, and photo journalism as well as editorial and marketing shoots. On a “typical day,” Chenoweth has captured megastar John Legend on stage at the Lyman Center, singing with such strength the microphone had to be turned down. She’s also traveled to Europe to photograph Southern’s choir performing to sold-out audiences — and made countless trips throughout New Haven neighborhoods to get shots of students volunteering, interning, and conducting research. And she’s spent hours taking portraits of faculty members, often learning about their fields of scholarship. The attached gallery showcases more of Chenoweth’s favorite photographs — images captured when the light was perfect and all was right with her world. 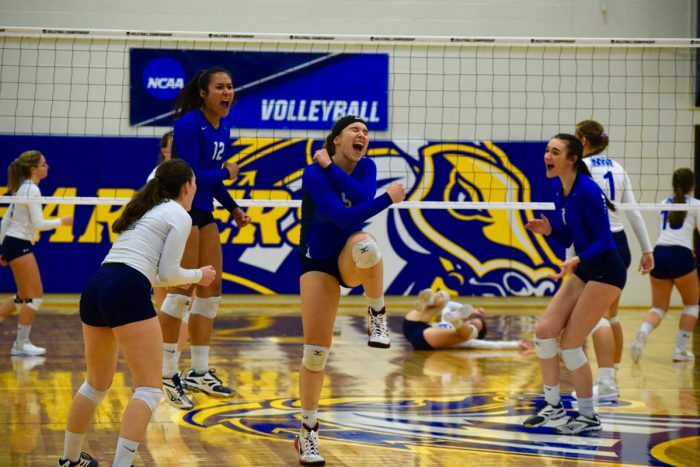 Fresh off a thrilling four-set win in its NCAA Tournament debut, the SCSU volleyball team is back in action this evening when it faces the host, top seed and rival, the University of New Haven The Friday, December 1 contest is scheduled for a 7:30 p.m. start at Charger Gymnasium on the campus of the University of New Haven. Free admission will be provided for SCSU students with a valid ID, and free transportation is also available. The vans will leave from Hickerson Hall beginning at 6:30 p.m. Student tickets can be picked up on the bus or at the SCSU table at Charger Gym.